View from campsite at Lake Louise Campground. 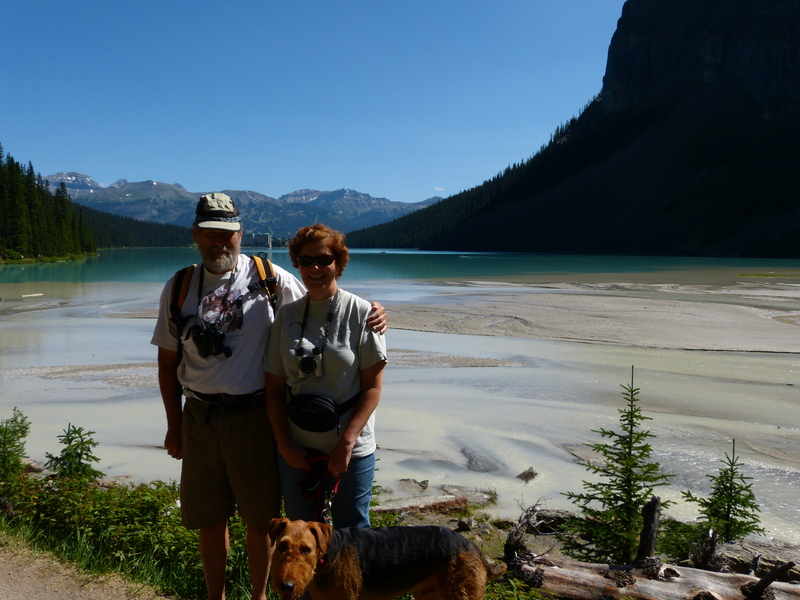 Charlie, me and Woolly Bear on the far side of Lake Louise, at the start of our hike “View of the Six Glaciers”. July 29th, Day 17 of our trip, arrived with sunshine and cool air. 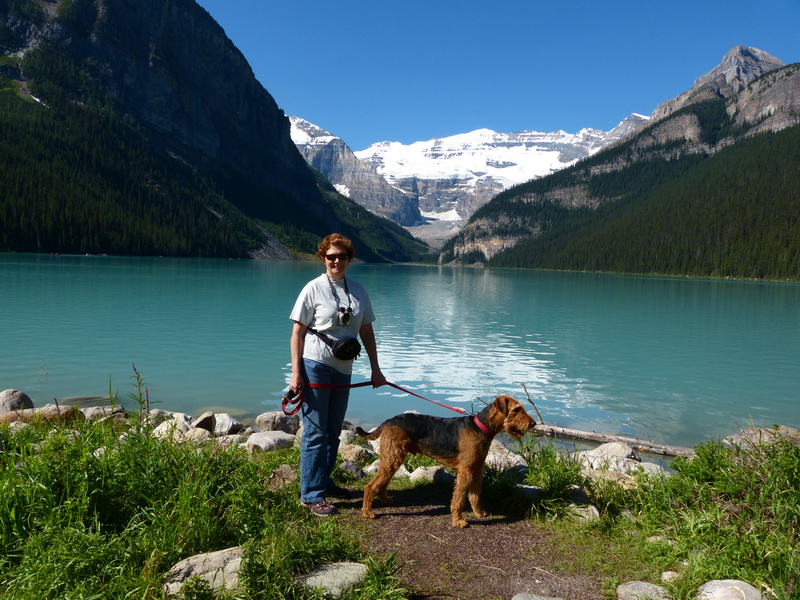 We decided to hike the Lake Louise trail to View of the Six Glaciers. This was a beautiful hike and consisted of 6 miles, round trip. Then we visited Moraine Lake. Lake Louise was rather crowded near the hotel and main parking lot, but the further we hiked away from the lake, the fewer people we saw on the trails. Woolly Bear made a great many friends, and we found the people to be very nice and friendly. The next morning we decided to drive to Yoho National Park, as it was adjacent to the Lake Louise area. 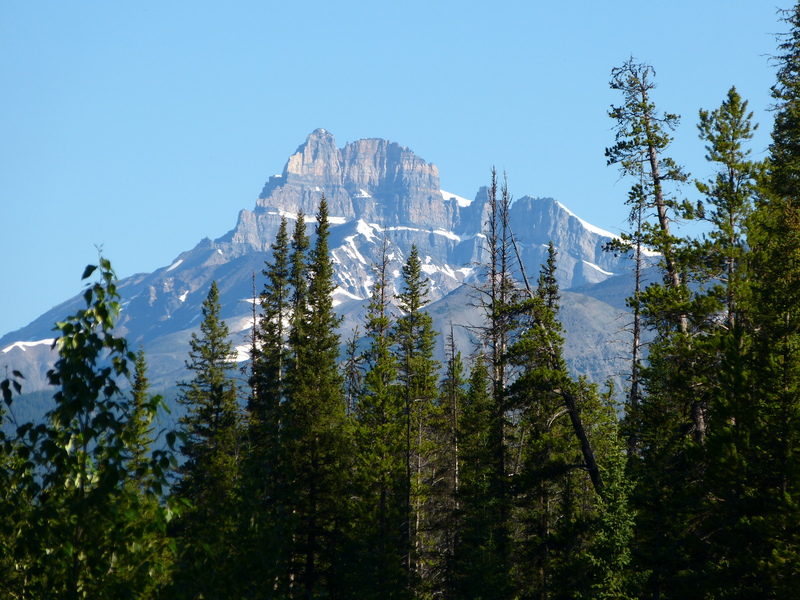 We had not planned to stay at Yoho, and definitely will need to go back to camp and hike. We had a beautiful, clear sunny day with blue skies for our hike around Emerald Lake in Yoho Park. We were halfway around the lake when we were caught in a fast moving thunder storm! Fortunately Woolly Bear is oblivious to thunder and lightening, unlike my previous pups, so he was quite content to hike through the rain and trees at the lake’s edge. 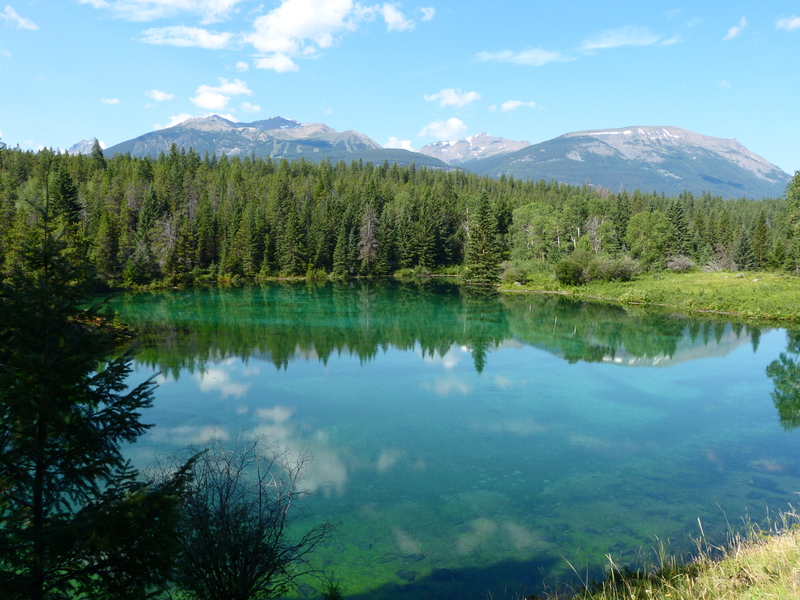 After our hike, we drove through much of Yoho, and made a note that we really need to spend much more time here! This entry was posted in Canada, National Parks on July 13, 2013 by Ramblin' Rose. Cricket would have been hiding under a rock if she was out in a thunder and lightening storm!